Waiting For a Girl Like You is here! “I think you’re nuts,” Marc said, pulling the car into park in front of Angela and Finn’s. “So put in your notice tomorrow. Tell them you have a full-time job being in love with me.” He pulled her hand to his lips. He waited on the street until she closed the front door behind her. She leaned on it, sighing, listening to the car pull away. Angela and Finn both turned away from tonight’s crime dramedy to look at her. Finn snorted and turned back to the TV, but Angela jumped up. After a quick shower, she opened her e-mail. The first one was from the university congratulating her on finishing her master’s thesis, and if she had any questions “do not reply to this e-mail address, but contact your advisor.” Master’s thesis, she hadn’t… The time on the e-mail said it had arrived about an hour and a half after she and Marc had left the diner. She opened her sent e-mail. About the time Marc was declaring his undying devotion, she had snuck home and submitted a master’s thesis and had been back in time to sink sobbing into Marc’s arms. 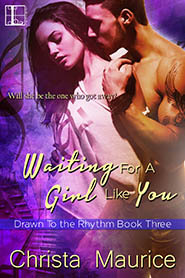 Waiting For a Girl Like You is available now!